In a single day, BMW forays into new and unexplored territories that could change the company forever. For the first time in its history, the Munich-based automaker revealed a front-wheel drive vehicle, one of many to come, that will allow the company to further capture the premium market. The compact vehicles will also require a smaller, efficient, yet fairly powerful engine, so it comes as no surprise that BMW has decided to look past its current offerings of four and six-cylinder engines and adventure into the world of three-cylinder powerplants. Meet the “Baby-Six,” a 1.5 liter three-cylinder turbocharged engine built on the 500cc per cylinder architecture. The compact engine has the same genes as the award-winning 3.0 liter six-cylinder unit, but with its own personality. “The 3-cylinder has its own character and sounds, doesn’t make you think it’s a 3-cylinder engine, ” says Dr. Bernardo Lopez Alvaredo, Powertrain, Head of Function Operation Evaluation, BMW AG. The new engine of family is one of BMW’s biggest bets for the future, and a costly one for sure. But it can pay high dividends. 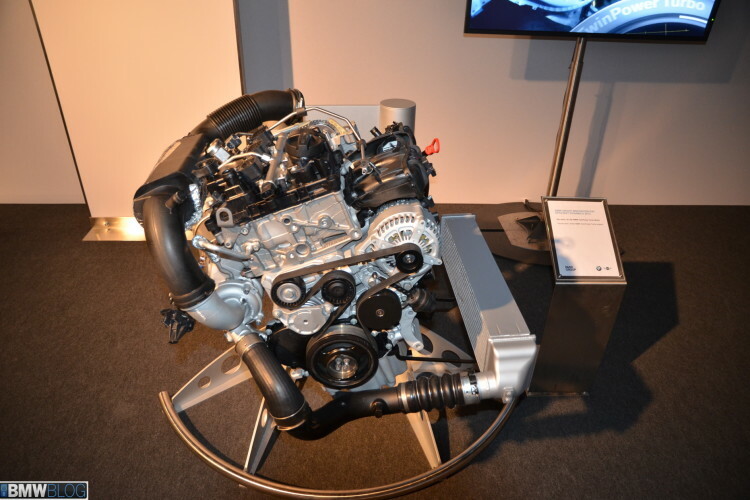 Produced in both diesel and gasoline variants, the new engine provides lots of low-end torque and offers a smooth feel similar to its older brother. Essentially a half-six engine, the N13 three-cylinder unit makes use of special balance shafts and dampers that keep vibrations in place, a common trait in these type of compact engines. The opposite turning shaft is an integrated and unique solution to the three-cylinder. BMW’s Twin Power Turbo technology is at the core of these new engines, for both diesel and gasoline. In the gasoline engine, Twin Power tech consists of High Precision Injection with direct fuel injection, VALVETRONIC variable valve control and double VANOS variable camshaft control. 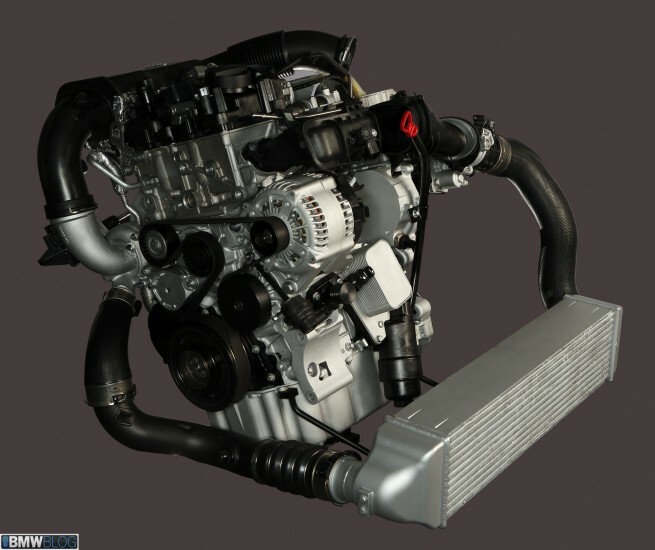 This setup further enhance both power and efficiency across the engine speed range. The Twin Power for diesels designate the combination of third generation Common Rail direct injection system with variable turbine geometry. These allow the BMW TwinPower Turbo diesel engine to be charged with a single turbocharger, twin turbochargers, or with a triple turbo unit. For engines with more than three-cylinders, turbocharging requires a TwinScroll. The 1.5 liter three-cylinder uses a mono-scroll that keeps the load step at steady 1,500 rpm. But how does it sound? “We looked at the concept and after first tests our enthusiasm grew. We are fans of both 3 and 6-cylinder engines,” says Steinpanzer. And in our short test drive of the new three-cylinder, we fully agree with that courageous statement. More on that in the next article. But fuel efficiency was not the only main driver behind this new family of engines. Thanks to its modular architecture, the same concept applies for the petrol and diesel units, which leads to essentially the same cost per part. 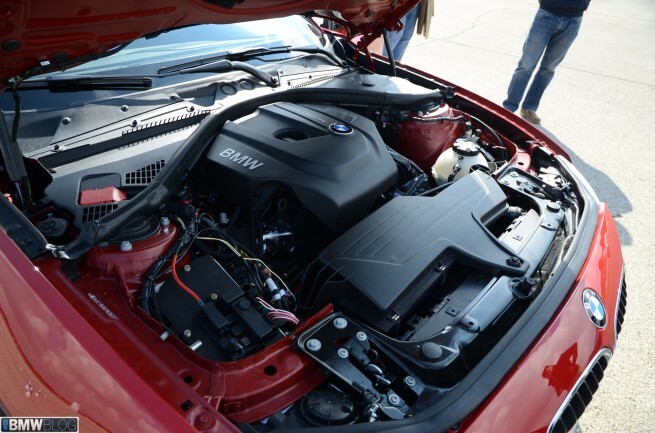 The synergy between these engines goes even further, visually BMW engineers wanted them to look identical so that the assembly line workers wouldn’t be able to differentiate them. Further cost reductions are achieved by making the production lines modular where BMW can build 3, 4 and 6 cylinder engines, gas and diesel. BMW will offer a range of power outputs, low, mid and high, based on the configuration of the car and of course, its weight. For gasoline, the power range starts at 30 kW and extends to 50 kW per cylinder. A little math gives us a range in horsepower from 120 to approximately 200 ponies. 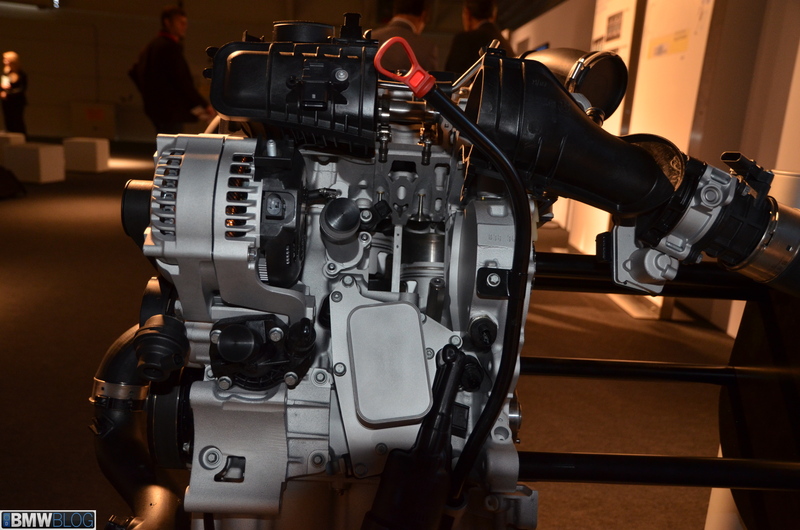 For diesels, the low end of the char shows 20 kW per cylinder or 80 horsepower per engine. At the high end, 180 ponies will drive the diesel-powered vehicle. The torque ranges are 180 to 270 Nm for petrol, and 225 to 300 Nm for diesel. We expect to see the new 3-cylinder in the upcoming MINI, as well as in 1 and 3 Series vehicles, including the future front-wheel drive automobiles. With its smaller footprint, the 3-cylinder can fit in a FWD, RWD and plugin hybrid setup. The first production car to use the 1.5 liter unit is the 2014 BMW i8; a tuned up version of the engine that sends to the rear wheels 223-hp and 295 lb-ft of torque. Will a 5 Series be a candidate for the 3-cylinder? “For a 5 series, if the engine is too small, and the drive is sporty and dynamic, then consumption won’t be great,” says Dr. Lopez. Report: BMW bringing 3-cylinder engines in the U.S.